100 Feet above the Rappahannock River, renowned landscape architect Richard Arentz found the inspiration to create Running Cedar on 70 acres in the Virginia Countryside. In collaboration with architect Richard Williams and interior designer Jose Solis Betancourt, Running Cedar is acclaimed by the national and international design community. Running Cedar’s main house is one room deep yet gracious in its flow from one room to the next. Windows overlook lush green landscaping everywhere. 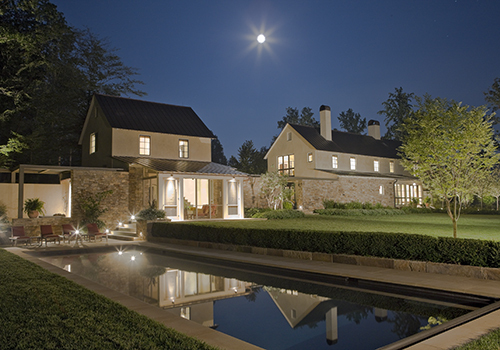 A massive Shenandoah stone wall divides the open floor plan and maintains a connection from the 6,500 square foot main house to the 1,250 square foot guest house. The kitchen was designed to conceal many of its functional appliances in a library-like fashion and acts as a center for casual entertaining. Perfect for summer entertaining, the open courtyard connects to the guesthouse with a vine-covered pergola. The swimming pool, guesthouse, and main residence flank a boxwood-edged west lawn. Manicured lawns and four-season landscaping include Running Cedar, the property’s namesake groundcover. Perennials and annuals bloom throughout the growing season. Running Cedar is located in the outskirts of historic Orlean. Passionate riders, writers, actors, politicians and others find peace, quiet and anonymity in the hills and meadows. Nearby are excellent theater, concerts, art galleries, wineries and fine dining. Running Cedar is offered for the first time at $ 4,450,000. Come take the tour.